The history of Halifax and the sinking of the Titanic will forever be intertwined. The Maritime Museum of the Atlantic commemorates not only the legendary Titanic, but also a number of others who were lost in the majestic ocean. During the sinking of the ship, the British vessel RMS Carpathia responded to the call and came to Titanic’s rescue. The Halifax based cable steamer Makay-Bennett was charged with the grim task of recovering bodies and collecting inventory of those lost in the disaster. The crew of the ship collected 306 bodies, 116 of which had to be buried at sea. The Makay-Bennett was relieved by the Minia, which recovered 17 more bodies, 2 of which were buried at sea. On May 6, the Canadian vessel CGS Montmagny recovered 4 more bodies and buried one at sea. The remaining bodies were shipped to a Halifax morgue and 59 were shipped by train to their families. 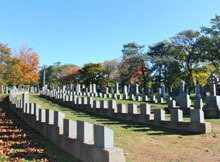 The rest were buried in Halifax cemeteries, giving the city a strong bond with the history of the Titanic. Contained within the flotsam of the wreckage were pieces of the vessel herself and items that told stories of those aboard. As part of the 100th anniversary of the sinking of the Titanic, the Maritime Museum of the Atlantic has its unique items on display. Relive the rise and fall of the Titanic in a reproduction deck chair and view the variety of over 50 unique artifacts recovered during the relief effort. See the history of the Titanic come to life with photographs depicting what happened on the night of April 14, 1912. Crucial in the process of recovering bodies, these bags were designed to recover and preserve the effects of those who died in the wreck. This particular bag belonged to passenger no. 41, a man by the name of Edmund Stone. A 33 year old first class bedroom steward, Stone’s body was found by the Mackay-Bennett and was buried at sea. Particularly effective in preserving the effects of victims during transport and at the morgue, these bags were also used following the Halifax Explosion of 1917. 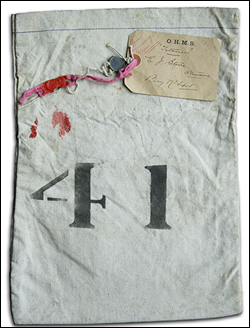 The effects of Edmund Stone were shipped to his widow in Southampton using this bag with the letters ‘O.H.M.S’ (On His Majesty’s Service) on the tag indicating a government mail shipment. The personal effects of the deceased were sold at auction in 2008. Cable ship crews had a tradition where pieces of shipwrecks were gathered and kept in remembrance of the event. 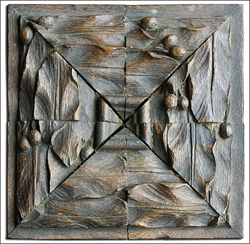 Many of these pieces are carved into various items such as picture frames, paperweights, and crib boards. The particular pieces of warpwood on display at the Maritime Museum of the Atlantic were donated by descendants of those involved in the Titanic rescue effort. In addition to large pieces of wood from the wreck, a deck chair was recovered during the effort and is on display at the museum. Whether the pieces are loaned or have been donated, these pieces of wreckwood offer a glimpse into the history of the Titanic and the tradition of cable ship crews. These pieces are artistic and give viewers a glimpse into the rich history of the Titanic as well as maritime tradition. This recovered piece truly evokes the emotion of sorrow following the sinking of the Titanic. 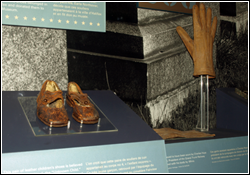 Part of the safekeepings from mortuary bag 4, this small pair of leather shoes belonged to a young boy who was recovered and buried at Fairview Lawn cemetery in Halifax. Extensive DNA testing revealed the identity of the child as 19 month old Sidney Leslie Goodwin of England. Further research revealed that his father was en route to Niagara Falls for a job offer. Mr. Goodwin, Sidney, and the rest of the family were aboard the Titanic on the night that it sank and all were lost in the disaster. The Maritime Museum of the Atlantic offers a complete history of the life of the Titanic as well as a variety of other vessels lost at sea. Recovered during the Titanic relief effort were items such as a photograph of the Titanic’s grand staircase and the shore-based wireless log. Highlighting the luxury of the ship and the lifestyle of those aboard, other items include a mahogany cabinet from a first class bathroom, White Star Line’s first class dinnerware, and the gloves of Charles Hays, the then president of Grand Trunk Railway.